Whether it be a critique of ladies’ headwear at the Royal Wedding, opinions on the News of the World scandal or the near-pathological desire to crown British rock music’s next savior (see Oasis, Blur, the Libertines, and Arctic Monkeys), the UK press isn’t exactly known for exercising journalistic restraint. Thus, when the Horrors, one of English resort town Southend On Sea’s darker attractions, followed up their 2007 garage punk debut Strange House with the more refined and sonically panoramic Primary Colours, critics heaped on the accolades, including a Mercury Prize nomination and NME’s best album of 2009 honors. It’s no surprise that expectations have become theatrically high for this year’s appropriately-titled follow up, Skying. To the Horrors’ credit, Skying sounds like the work of a band unfazed by the prospect of becoming England’s Next Big Thing. It’s a spacious album with strong melodies, skillful arrangements, and no rough edges — it feels more vibrant and self-assured than anything the five piece outfit have ever done. Clearly, the band are talented, capable musicians who’ve spent a considerable amount of time in the studio getting small details right and harvesting a variety of musical influences, including Echo and the Bunnymen, the Psychedelic Furs, Ride, Spiritualized, and Human League. 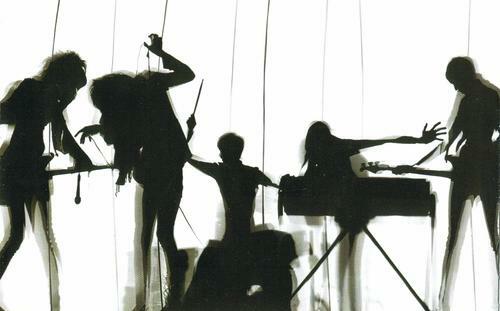 But while they remind you of a lot of influential bands, the Horrors never quite arrive at that same level of greatness. 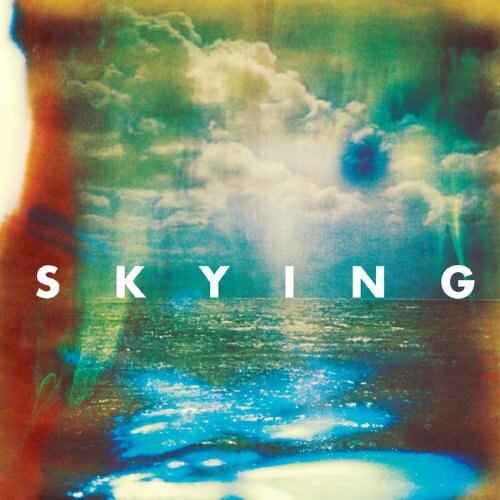 You can legitimately argue that Skying would fit right in amongst the records of many eras — late 70’s post-punk, early 80’s New Wave or 90’s Britpop; unfortunately, it wouldn’t stand out in any of them either. Skying is stylistically diverse but remains, at its core, a chameleon unsure of its own color; the album is a reluctant triumph of craft over originality. Skying thrives largely on the artful balance of two forces — the scratchy baritone of singer Faris Badwan (whose deadpan vocals are a hybrid of Richard Butler and a subdued Ian McCulloch) and the recurring melodic splashes of soaring guitar and airy synthesizers. It helps that the songs are all pristinely recorded, allowing your ears to pick out dozens of familiar timbres and recognizable chord progressions. Sometimes, these aural tributes pay off, such as on “I Can See Through You” which blends Pulp’s vivacity with the bouncy pop of Simple Minds. But other times the mimicry wears thin — “Monica Gems” apes Elastica but is completely devoid of their wry, punk snarl. The Horrors sound most convincing on dense, multi-part epics like “Moving Further Away” which features a moody keyboard signature at the song’s beginning and finishes with a furious rock out, flipping the arrangement of Primary Colour’s best track, “Sea Within a Sea,” on its head. “Still Life” is Skying’s centerpiece and plays a similar trick. In its first minute, the song’s integral elements are revealed one by one (including an icy, OMD-like synth riff and an atmospheric guitar loop that’s oscillates between soothing and unsettling) until all the pillars are in place to support the track’s finale, replete with stately horns, orchestral strings, and a tidal wave of Badwan’s multi-tracked vocals. Whereas “Sea Within a Sea’s” components fade away until only a single keyboard line remains, “Still Life” does the opposite. It’s the kind of irrepressible, slow burn of a song that just keeps adding more and more layers, soaring toward infinity even as the track fades out. As a lyricist, Badwan too often relies on platitudes throughout Skying, proclaiming “You gotta give me more,” “Everyone seems so far away” and “I can see through you,” the last of which might be moderately interesting if was followed by anything other than the inexcusable “la la la la la.” His lyrics have the sort of intentional ambiguity that strives for broad appeal but too often teeters between laziness and tedium. To make music for the masses, you need to be able to write rock anthems with big hooks, and that just isn’t the Horrors’ thing. They’re at their best when they sound pensive, brooding, and slightly weird. Skying’s finest moments occur when the Horrors catch you off-guard — like when the celestial horns part to reveal a sudden barrage of guitar on “Endless Blue” or when a melody eerily reminiscent of Slint’s epic “Washer” surfaces on album closer “Oceans Burning” with the ominous sense of dread swapped out for drowsy, psychedelic longing. Badwan murmurs “Bring your wonders to life” through a gorgeous haze of xylophones and out-of-phase guitars until the song devolves into its second section of howling feedback and motorik drumbeats. It feels like the all-hell’s-broke-loose climax of the Verve’s “Come On,” which is fitting because Skying has the same sonic refinement, consistent songwriting, and “we’ve arrived” quality of Urban Hymns (though, alas, nothing near the caliber of “Bittersweet Symphony”). Skying is a polished effort whose impeccable recording and referential pleasures virtually guarantee that it won’t receive many, if any, bad reviews. But that doesn’t make it a first-rate album. It’s got the sweeping scope and grandiosity of Britpop, but also its tendency toward lyrical banality; it reaches for New Wave’s cinematic romanticism but bears the same morose detachment. If this critique of a promising young band seems rather dour and pessimistic, it’s because of a nagging suspicion that Skying is their career-best effort but certainly not on par with other magna opera like The Stone Roses, Ladies and Gentlemen We Are Floating In Space, or even (What’s the Story) Morning Glory? The Horrors feel almost genetically engineered to please, inspiring a dull fascination in place of rabid excitement. Deviations and mutations, especially the bizarre ones, are what push music forward, and for a band with this kind of chops and range (not to mention the sinister namesake), it’s fair to expect more risky, compelling experiments. In some alternate reality, the Horrors may have been the world’s most accomplished post-punk cover band (that’s no small feat) — instead they’re a pretty good rock group. Skying exudes remarkable proficiency and a sense of command. But greatness demands something more. Now that I have a Spotify account I’ll actually be able to listen to many of the albums you review which is exciting. Once I am done completing listening to the “1001 albums you must hear before you die” I want to go back to your earlier reviews and check out many of the bands that may be available for streaming. Isn’t Spotify great? “1001 albums” is a cool way to find little known classics, although my one complaint is that the list is skewed toward artists that were popular in Britain at the expense of some truly essential American indie music (no Modest Mouse, Interpol, Built to Spill, Slint, Yo La Tengo, Galaxie 500, etc.). Otherwise, it’s a great reference. 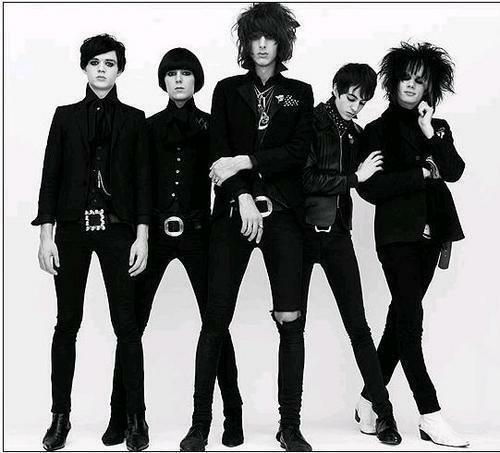 This entry was posted on August 2, 2011 by Jeff Goodwin in Reviews, Skying, The Horrors and tagged britpop, faris badwan, new wave, post-punk, primary colours, skying, strange house, the horrors.